Powers/Abilities: Buck Richlen is an accomplished pilot. He was a typical agent of SHIELD, and had access to a variety of devices, including guns and gas masks. (Iron Man I#119 (fb) - BTS) - Buck Richlen, Val Adair and Adam Manna were assigned by Nick Fury to engage in a hostile takeover of Stark International so that SHIELD could resume using them as their main weapons supplier. However, the three men secretly conspired to have Tony Stark murdered instead in order to achieve their goals. (Iron Man I#116 - BTS) - Spymaster attempted to kill Tony Stark by setting off a bomb in his penthouse, but the bomb slew the Ani-Men instead. (Iron Man I#117) - Spymaster seemingly slew Tony Stark, but was tricked by Stark's LMD stand-in. He stole information on Stark International's stockholders, but Iron Man caught up to him and defeated him, reclaiming the information. Richlen, Adair and Manna were forced to plan for another opportunity, and went on to meet with Nick Fury at the NATO/SHIELD Defense Expo. (Iron Man I#118) - When Tony Stark came to the SHIELD Helicarrier to participate in the Defense Expo, Val Adair was assigned as his security guard, but Stark ducked away from him so that he could investigate SHIELD's files, having guessed from Spymaster's equipment that SHIELD had hired him. Adair informed the others that Stark suspected something, and they used knock-out gas to incapacitate him and everyone else on the Helicarrier. Donning gas masks, they scooped up Stark's body and threw him off the Helicarrier. Stark revived in mid-air and returned as Iron Man. He defeated Adair and Manna, but Richlen escaped from him, and took the unconscious Nick Fury as a hostage, ordering Iron Man to turn his repulsor rays on himself, or he would kill Fury. (Iron Man I#119) - Instead, Iron Man sent out an electromagnetic pulse that caused a ceiling camera to overload, blinding Richlen with its explosion. Iron Man then beat Richlen unconscious. Fury had Richlen and his men sent to a detention cell when he regained consciousness. Fury later admitted to Stark that he had ordered Richlen to takeover Stark International, although he had never condoned the assassination attempts. (Moon Knight IV#17 (fb) - BTS) - Buck stole a plethora of technology from Stark International and made plans to sell this technology after being fired from SHIELD. (Iron Man IV#28) - Now drummed out of SHIELD, Richlen became a mercenary and wound up in the employ of the drug lord Xang Kong. When Kong arranged to assist Jack Kooning in hunting the Mandarin in an attempt to kill him, he assigned Richlen to pilot Kooning to the drop zone. (Moon Knight IV#17) - Carson Knowles (Black Spectre) overheard Buck at a diner talking to friends about selling the stolen Stark technology. (Moon Knight IV#18) - Black Spectre followed Buck and his friends to Buck's warehouse and slew Buck's friends. He then forced Buck to show and explain to him the nanotechnology stolen from Stark that enabled the user, injected with first stage nanites, to control another person, injected with second stage nanites. Comments: Created by David Michelinie, John Romita, Jr. and Bob Layton. There was a fourth member of Richlen's conspirators who appeared with them in Iron Man I#117-119, but he wasn't identified. 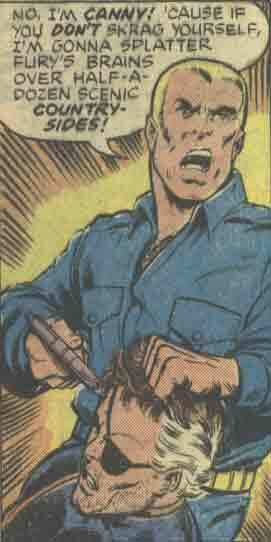 Although SHIELD had been played as "heavys" in Marvel stories before, this was the first time that corruption was seen as a serious issue within SHIELD, and the first demonstration that even Fury himself could betray his friends. 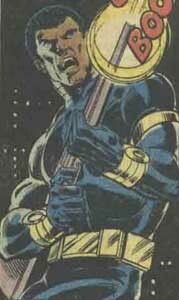 Modern readers are now used to corruption within SHIELD, to the point where any SHIELD agent appearing in a modern Marvel comic who doesn't have a pre-established history is considered suspect. Fury I#1 claimed that the Fury in this story was an LMD working for the Deltite, but this is in error; the LMD the Deltite used (referenced in Nick Fury Vs. SHIELD#3) was utilized in Iron Man I#174-175 -- a completely different story. I think the names of the villains Buck Richlen and Val Adair probably referred to Rich Buckler, who briefly used the pseudonym Ron Validar. David Michelinie and Bob Layton had worked with Buckler on Star Hunters at DC. When Buckler was found to have swiped a spaceship design from a Saturday morning animated show they asked for him to be fired, but the editor backed Buckler, precipitating Michelinie and Layton to leave DC for Marvel. Thanks to Doug Stone for pointing out Buck's appearances in Moon Knight. Val Adair was a member of Richlen's conspiracy to have Tony Stark killed, and oversaw their attempts to have the Spymaster kill Stark. He was assigned to Stark as his security guard when he attended the NATO Defense Expo aboard the Helicarrier, but Stark ditched him so that he could investigate the conspiracy. Adair warned the others, and joined them in their takeover of the Helicarrier, only to be beaten by Iron Man, and ultimately imprisoned by Nick Fury. (Moon Knight IV#17 (fb) - BTS) - Adair was stabbed in the neck in prison and died. Adam Manna was a member of Richlen's conspiracy to have Tony Stark killed, and oversaw their attempts to have the Spymaster kill Stark. He was defeated by Iron Man aboard the SHIELD Helicarrier and imprisoned by Nick Fury. (Moon Knight IV#17 (fb) - BTS) - Manna died of testicle cancer in prison.